In 2001, the North Carolina State Historic Preservation Office (NC-SHPO) received a federal grant to survey structures on Roanoke Island, and the Dare County and Currituck County Beaches. The Outer Banks Conservationists added to the federal funds and managed the project. The survey was conducted by architectural historian Penne Smith Sandbeck, former employee of the NC-SHPO. The Outer Banks Architecture Survey Collection documents the efforts of North Carolina State Historic Preservation Office in their attempts to survey local architecture on the Outer Banks. The reports not only document those structures that should be recommended for the National Register of Historic Places, but to also get a better sense of what styles of architecture are regional and how the overall vernacular landscape has evolved and changed. Department of Cultural Resources. Office of Archives and History. Division of Historical Resources. State Historic Preservation Office. Outer Banks Architecture Survey is arranged alphabetically by geographic location. In 2001, the North Carolina State Historic Preservation Office (NC-SHPO) received a federal grant to survey structures on Roanoke Island, and the Dare County and Currituck County Beaches. The Outer Banks Conservationists added to the federal funds and managed the project. The survey was conducted by architectural historian Penne Smith Sandbeck, former employee of the NC-SHPO. Several other historians and the staff of the Outer Banks History Center assisted. Outer Banks Conservationists, Inc.(OBC) was founded in 1980 and is a private nonprofit 501(c)(3). The mission of the OBC is to protect natural, cultural and historic resources through preservation and conservation of a sense of place, and through public education, interpretation, and outreach, to instill these values in others for the benefit of future generations. The OBC has restored, and continues to maintain and operate, the Currituck Beach Light Station in Corolla, North Carolina. The Currituck Beach Lighthouse was awarded to the nonprofit by the United States Department of the Interior and the deed transferred to the OBC, Inc. on October 17, 2003. 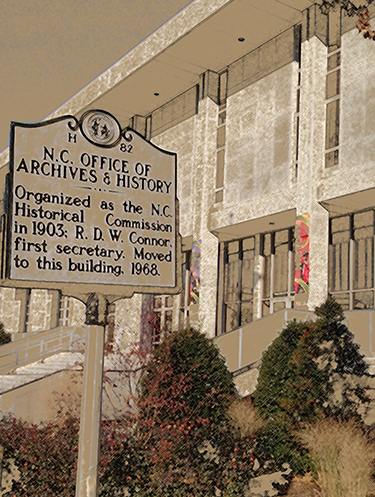 The North Carolina State Historic Preservation Office assists private citizens, private institutions, local governments, and agencies of state and federal government in the identification, evaluation, protection and enhancement of properties significant to North Carolina history and archaeology. The agency carries out state and federal preservation programs and is part of the Office of Archives and History, North Carolina Department of Cultural Resources. Penne Smith Sandbeck was the principal investigator for the 2001-2002 North Dare and Currituck Banks Historic Architecture Survey, which included Roanoke Island. A graduate of the University of North Carolina at Chapel Hill (B.A., 1983), Ms. Sandbeck received her master's degree in Art History from the University of Delaware in 1999. She was an historic preservation consultant between 1994 and 2003, and has been an architectural historian with the North Carolina Department of Transportation (NCDOT) since February 2003. [Identification of item], ORG.5006, Outer Banks Architecture Survey, Outer Banks History Center, Manteo NC, USA. The survey addressed structures located along the barrier islands between the Virginia border and Oregon Inlet, including Roanoke Island that were constructed prior to 1950 and that had little or no alteration from their original design, especially those retaining a strong sense of early character and reflecting their original surroundings. These included Victorian houses, Craftsman bungalows, shingled beach cottages, concrete "flat top" houses, weather-boarded and concrete block commercial buildings, early hotels, hunt clubs, lifesaving stations, commemorative markers, nineteenth-century farmhouses and early twentieth-century schools. Some properties were surveyed because they were clearly eligible for the National Register. Others were not eligible because they had either been altered or surrounding buildings that would have made them contextual have been lost. These ineligible structures were included because they were important examples of regional architecture or events so they need to be surveyed to understand the whole vernacular landscape. They could also bolster the case for why certain buildings in better shape were worthy of placement on the National Register.